Christians often spend so much time engaged in their present-day trials and tribulations that they fail to understand and learn from the experiences of Christians of the past. In the New Testament, God has supplied His church with multiple examples of the difficult times faced by the early church. John Ritenbaugh provides insight into how those experiences necessitated and shaped the epistle to the Hebrews. A curious phenomenon ties together several well-known, biblical stories: God makes a judgment and divides His people into two groups, sometimes splitting them right down the middle! 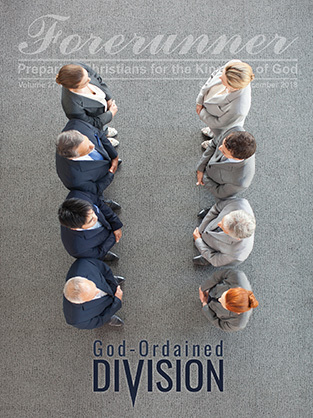 Noticing these divinely ordained separations, Charles Whitaker probes the various stories to show that God uses the act of division to reconfigure His people along lines we often do not expect. Many sermons and articles - even books - have covered the Parable of the Prodigal Son, but most of them dwell on the relationship between the prodigal and his father, giving the elder brother short shrift. Ted Bowling gives the elder brother his due, explaining why Jesus adds his reaction to his younger brother's return. The prophet Amos foretells of a time when a famine of hearing the words of the Lord would fall upon Israel. People would search everywhere for it but fail to find the truth. Loren Saxton puts this prophecy into verse, seeing it being fulfilled in our day. It would seem only appropriate that a person who fills the office of Christian minister would believe in the Christian God. That assumption, however, is proving to be less correct as society passes more deeply into the post-Christian era. Richard Ritenbaugh explores the admission of a United Church of Canada minister who openly proclaimed her atheism - and retained her pulpit. Copyright 2018 Church of the Great God. All rights reserved.